Before trying the Renault 6-wheeled car, General Estienne showed a very keen interest in the Saharan expedition organised by André Citroën and his original Kégresse caterpillar-tracked vehicles. The challenge was to cross the Sahara from north to south between Touggourt (Algeria) and Timbuktu (Mali), and to open a route for cars. Citroën sport type tracked vehicle with which André Citroën and his wife crossed the Sahara to meet the expedition. The expedition was led by Louis Audouin-Dubreuil, a former aviator familiar with North Africa, and Georges-Marie Haardt, general manager of the Citroën factories. 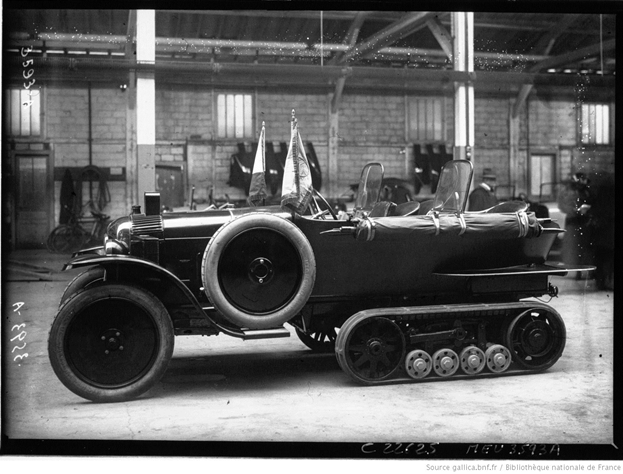 It comprised five Citroën caterpillar-track vehicles each carrying two men, including one of General Estienne's sons. Twenty days and 3200 km later, their arrival in Timbuktu had a global impact and opened the way for further raids such as the one organised in 1924, where Citroën tracked vehicles competed with Renault 6-wheelers.